Ridgeway was selected to create a commission for the Boro Tower in Tysons, Virginia. 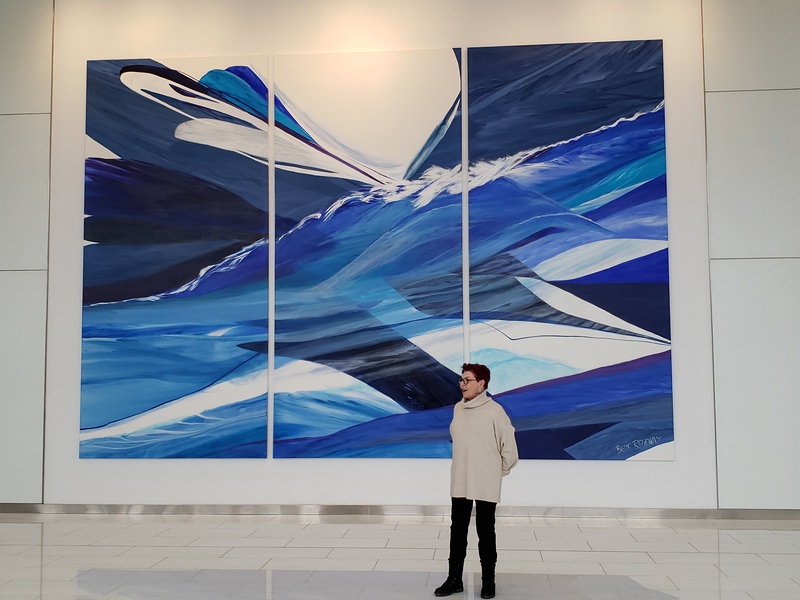 The photo above, "Art of the Imaginals" a triptych 15 feet x 21 feet, was installed on Jan 12, 2019. Click HERE for film on the project by Carlo Zanella. The artist's work has been selected for Woman's Essence, a concomitant event of the 58th Biennale in Venice, Italy in May 10-19, 2019. The exhibition is curated by noted curator and critic, Dr. Laura di Trapani who is also editor of the exhibition catalog. is a worldwide contemporary art prize created to discover, recognise and give support to a women artists. The Award aims to make a major contribution to the careers of artists involved in the dynamic cultural development of societies. Ridgeway has also been selected to participate in this event. She was a part of the innagural Biennale in 2013. This takes place May 22-26, 2019 in the Chelsea Old Town Hall on King' Road, where artist s such as Augustus John and Alma Tadema established what is known as the true artistic center of London. Finalist Award 2019 - Artist of the Year - by Circle Fine Arts, Lyon, Fr. The artist received several awards at Art Design Consultants Annual ACA Competition in October 2017. Among them, two purchase prizes, Runner-Up to Best in Show and three gallery contracts. Ridgeway has been selected by Art Tour International Magazine as one of their "Top 60 International Contemporary Masters 2017". The award was presented in Florence, Italy in May 2017. The artist was awarded the prestigious DaVinci International prize in January 2016 in Rome, Italy. "I decided to assign you this prize for your great research and experimentation in technique that uses light in unique ways". The artist received the prestigious 2012 Oxford Univ. Alumni of Tuscany Prize at Chianciano Art Museum's "Art of the Mind" exhibition in the Chianciano Art Museum in September 2012. This exhibition is the first to be entirely abstract art. Click HERE to view the catalog online. Ridgeway participated in the London Art Biennale in Jan 2013. Click HERE to visit the London Art Biennale website. Click HERE to view invitation online. In 2013, the artist was selected to appear in the book, "Important World Artists," published by World Wide Art, Books, Inc. The artist collaborated with well-known Japanese Fashion Designer, Mihara Yasuhiro on his 2013 Spring and Summer Womens collection. The designer, who has been described as the young and hip Ralph Lauren, used Ridgeway's transparent images to create both 100% silk and stunning European-style knits for dresses, pants, blouses and exquisite t-shirts. "Color of Butterfly" was launched during Fall Paris Fashion Week in October 2012. The designer is revered throughout Europe and Asia for his unique and eclectic designs. Click HERE for video installation of "Color of Butterfly"
Click HERE to visit Mihara Yasuhiro's website.